"I was inspired a lot by what was going on," says Mort Gerberg of this illustration from his 1971 book, Right On, Sister! "I had previously met the woman who would become my wife, who was an activist, so I was marching even before I knew I was." Known for his clever combining of wit and social commentary, Mort has been a working cartoonist since the '60s, most notably for The New Yorker. 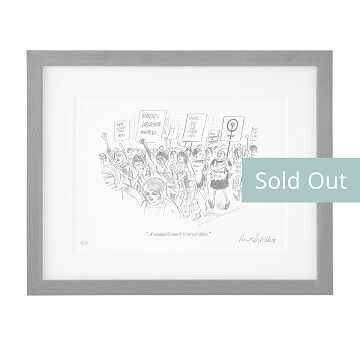 "Woman's Work" is one in a series of limited edition prints we're offering (just 10 of each), numbered and signed by him with the same pen he uses to draw. Framed in solid ash wood with a double-thick mat, it's a gift for the person who enjoys art with a wink. Printed and framed in Oregon.